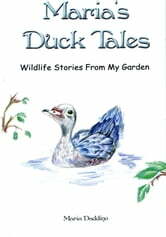 Award Winning Nature Stories from a National Wildlife Federation Certified Backyard Wildlife Habitat! 5-Star Reviews! Happy, sad, and at times a little whimsical, "Maria's Duck Tales: Wildlife Stories From My Garden" is a collection of short stories of the sometimes complicated, sometimes heart-breaking but always enriching relationship between a woman and the wildlife who call her garden home. Sharing her observations and interactions with the wild ducks, swans, opossums, ospreys and squirrels of Penataquit Creek, the stories are interwoven with fascinating facts about wildlife and insights into communicating with and understanding our wild friends. Maria's poignant and heartwarming memoirs, as well as the unique bond that she shares with her garden visitors, are, at times, touching, delightful, comical and heartrending. Maria, a passionate gardener and wildlife enthusiast, invites and welcomes all wildlife into her garden. Her extensive native and natural garden, certified as a wildlife habitat by the National Wildlife Federation, has been on display in several East End garden tours. Maria lives in East Quogue with her collie Christy, her parrot Pablo and all of her "wild-friends."